Random Food – Yummy Chocolate Goodness! Love chocolate? Then don’t waste it during Zero Waste Week! Be sure to gather up all of the chocolate you have in your fridge and scoff the lot! 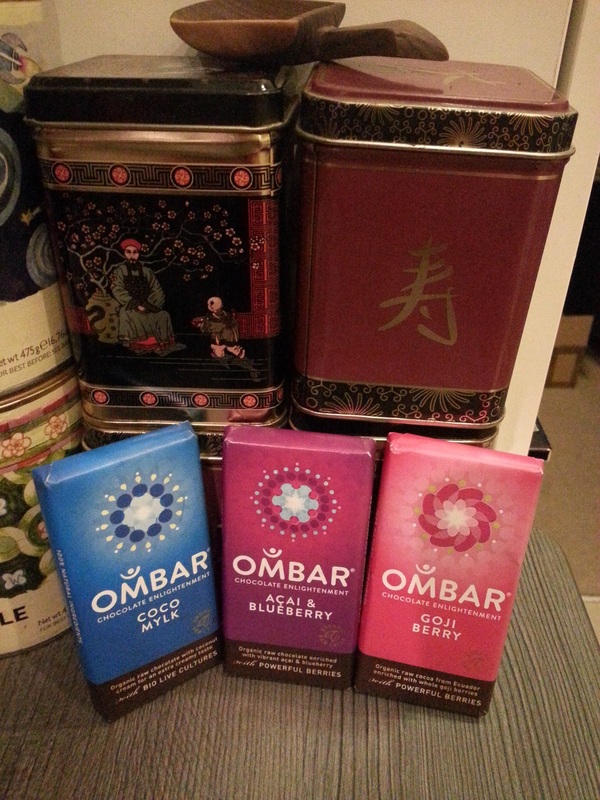 Last night, I was lucky enough to find lots of chocolate lurking in the fridge, as those lovely people at Real Foods were kind enough to send me a selection of some of the different flavours of Ombar to try out. Ombar chocolate is very different to others you may have tried. Not only are they made using the most yummy raw, organic cacao from Ecuador, they’re sweetened using sustainable organic coconut palm sugar and some have bio live cultures thrown in for a bit of tummy love! And yes, they are completely vegan, with ethical sourcing, and much better for you that regular chocolate! Now, I’m already a huge fan of the Coco Mylk bar (blue wrapper). It’s rich and creamy, with coconut cream to thank for that, and it’s easy to think you’re eating a bar of milk chocolate. And with all those added probiotics, you can now say that eating chocolate is good for your health! And let me convince you more by telling you a bit about the ingredients. Coconut Sugar – this retains more of the nutrients than regular sugar does, including iron, zinc, calcium and potassium. It also contains a fibre called inulin, which can slow glucose absorption and therefore raises your blood sugar level much less than regular sugar. Probiotics – these are basically good bacteria, and we need to maintain a balance of the good and bad in our gut, otherwise we get all kinds of tummy troubles. These cultures are therefore great to ingest, and much more tasty in chocolate! Raw Cacao – this is made by cold-pressing raw cocoa beans, which keeps the living enzymes happy and removes the fat (cacao butter). It’s much better than cocoa powder, which has been heated and therefore has a lowered nutritional value. Raw cacao can actually protect your nervous system and help reduce blood pressure. So, what did I think of the other flavours sent to me? The first was Acai & Blueberry. It was very dark compared to the Coco Mylk, as it has no coconut cream. Antioxidant rich, you can really taste the berries in the chocolate, and it has a slightly bitter edge. If you like a rich, dark chocolate with a bitter note, you’ll love this. Last up was the Goji Berry. This was somewhere in between the richness of the dark Acai & Blueberry, and the creamy Coco Mylk. With chewy pieces of Goji found within. It had a somewhat creamy edge and the bitterness from the previous bar was gone. This is definitely going to be in my shopping basket in the future. I’m really impressed with the range of flavours Ombar have produced – they are so unusual and really get the taste buds going. Some of the other options include Strawberries & Cream, Green Tea & Lemon, and Cranberry & Mandarin. There is also a basic dark chocolate option. I’m on a mission to try them all! The whole range is available from Real Foods. Have you tried Ombar? If not, go out and grab one and let me know what you think! Have a wonderful, chocolate filled weekend!